Two Terminator baits helped Ott DeFoe win a third Bassmaster Open on Tennessee’s Douglas Lake, his home water. The first was no surprise – a Terminator® Pro Series Jig, long a go-to bait for DeFoe. 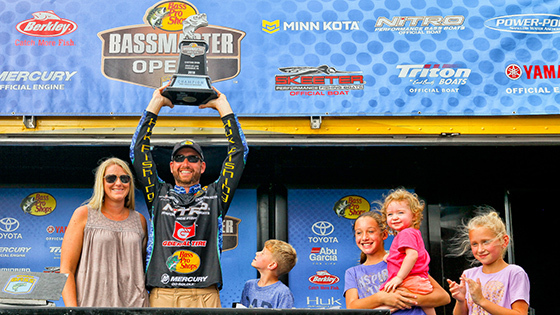 The second threw Bassmaster media observers for a loop when DeFoe started slinging it – a Terminator Walking Frog Jr.
“DeFoe made a bold move, switching to a most obscure lure choice,” Bassmaster reported. Winning with a Walking Frog Jr. was especially gratifying for DeFoe because he helped Terminator design the bait. DeFoe won the tournament with 44 pounds, 9 ounces, after catching three five-fish limits weighing 15 pounds, 16 pounds and 15 ounces and 12 pounds, 10 ounces. He previously won Bassmaster Opens in 2017 and 2014 on Douglas Lake, which is located just up the road from where he lives north of Knoxville. This year and last, he caught ‘em best in an area way up the French Broad River – and area he needed a shallow-draft aluminum boat to reach, dodging boulders and crossing awfully skinny water at times. Knowing the area so well gave DeFoe the confidence to stick with it, even when it wasn’t giving up bites as easily as it usually does. Step 1 in picking apart his key areas was pitching a ½ oz. black-and-blue Terminator Pro Series Jig, which was DeFoe’s key bait on Thursday, the first of the three-day tournament. 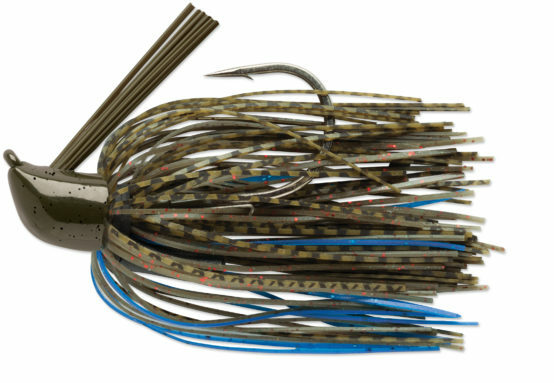 Featuring a unique head design, Terminator’s Pro Series Jig is much more versatile than most jigs. Custom jig-skirt colors, color-matched brush guards, a single rattle and a heavy VMC® Black Nickel hook further differentiate it from other cookie-cutter jigs that all pretty much look the same. They’re available in five sizes: ¼ oz, 3/8 oz, ½ oz, ¾ oz and 1 oz. On the second day of the tournament, the water level in DeFoe’s key area had fallen several inches and the water had cleared up a bit from the 6 to 8 inches of limited visibility in effect on day one. Those changes caused DeFoe’s jig bite to cool off, so he had to come up with a Plan B. Both the 2 ½-inch Walking Frog Jr. and its big brother, the 3-inch Walking Frog, feature a custom VMC® frog-gap hook that hugs the frog’s body so snugly that it’s virtually snagless, even in heavy cover. Walking Frogs feature lifelike round-rubber legs and heavy-duty welded line ties. They’re tail-weighted to increase casting distance and stability on the retrieve. Walking Frog bodies are extra-soft, easily compressing when a bass bites, increasing hook-up ratio. “The vast majority of the strikes on the frog came in the first foot of the retrieve,” Defoe reports. He often twitched it as many as four or five times in the strike zone before getting bit. A Walking Frog Jr. weighs half an ounce. It’s available in 16 color patterns: Hot Shad, Bluegill, White Camo, Black Camo, Cocoa Camo, Hot Mud Camo, Brown Camo, Yellow Leopard, Lime Leopard, Green Leopard, Hot Chartreuse Shad, Smoke Silver Shad, Bull Frog, Ghost Pearl, Ghost and Black Chartreuse Leopard. Defoe’s color of choice Friday and Saturday was Smoke Silver Shad. On Saturday, when the bass were less aggressive, DeFoe’s key bait was a 6-inch soft-plastic worm rigged on a 3/0 VMC® Ike Approved Heavy Duty Worm Hook with a 3/16 oz. weight. See Terminator® Walking Frog Jr. This entry was posted in News, Pro Staff, Rapala. Bookmark the permalink.